Save 50 cents per item. For those of you that already have our spices in jars, or have limited space, or if you just want to spend less. Save 50 cents and order refills. Instead of our usual jar we'll pack our spices in a food grade, heat sealed bag. Same blend same amount, just less expensive packaging. Ingredients: garlic, oregano, turmeric, black pepper. Ingredients: Paprika, Black Pepper, Onion, Garlic, Cayenne, Coriander, Turmeric. Ingredients: garlic, paprika, celery, pepper, oregano, cumin. Ingredients:garlic, paprika, pepper, oregano, cumin, thyme. Ingredients: garlic, onion, pepper, thyme, lemon peel. Ingredients: garlic, paprika, cayenne, pepper, onion. Ingredients: garlic, onion, coriander, black pepper, parsley, red pepper, orange peel, paprika, green bell peppers. Ingredients, garlic, basil, coriander, onion, red & black pepper, dill seed, mustard. Ingredients: basil, parsley, garlic, onion, cayenne, crushed red pepper, bay leaves. Ingredients: coriander, black pepper, garlic, cumin, turmeric. Ingredients: paprika, garlic, black pepper, onion, cayenne, oregano, thyme. Ingredients: garlic, rosemary, basil, red pepper, orange peel, onion, parsley, paprika, celery. Ingredients: garlic, parsley, oregano, black pepper, paprika. Ingredients: rosemary, thyme, marjoram, basil, lavender, savory, fennel. Ingredients: parsley, basil, oregano, rosemary, thyme. Ingredients: garlic, black pepper, paprika, allspice, cayenne, onion. Ingredients: garlic, lemon peel, black pepper. 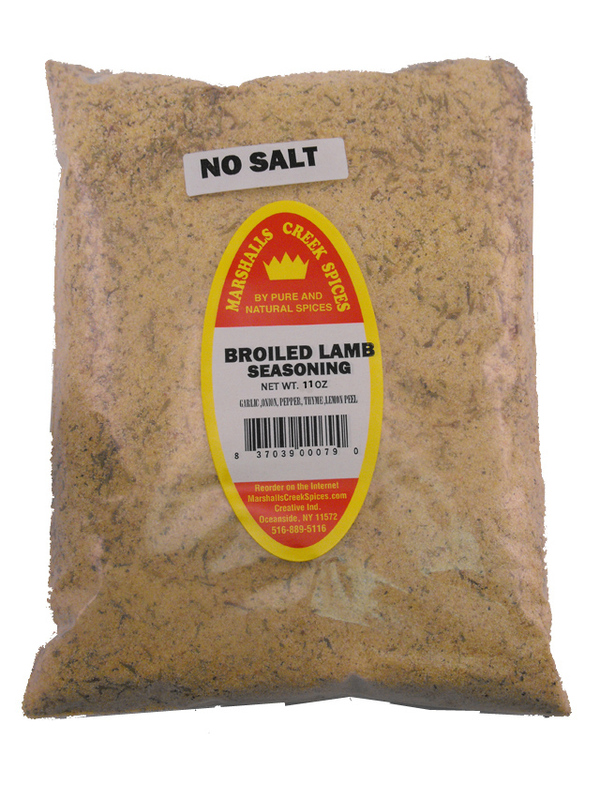 11 ounce refill pouch of No Salt Long Beach Larry's All Purpose Blend. Ingredients: smoked paprika, old bay (no salt), Herb De Provence, onion, garlic, black pepper. 11 ounce refill pouch of No Salt Mama "D"
Ingredients: onion, parsley, basil, thyme, rosemary, garlic, mustard, oregano, celery, pepper, cumin. Compare to: "Old Bay Seasoning ®"
Ingredients: ginger, coriander, cinnamon, cumin, orange peel. Ingredients: garlic, oregano, parsley, onion, black pepper, basil, paprika. Ingredients: salt, garlic, oregano, parsley, onion, black pepper, basil, paprika. Ingredients: garlic, onion, pepper, basil, parsley, bay leaves. Ingredients: garlic, oregano,thyme, coriander, marjoram, black pepper, sage, cumin. Ingredients: garlic, onion, pepper, thyme, parsley, rosemary. Ingredients: garlic, paprika, onion, thyme, oregano. SAZON SEASONING NO SALT, WITH ANNATTO REFILL? Sprinkle No Salt Meat Tenderizer liberally, pat onto meat/steak, and let sit for 10-15 minutes before cooking. Ingredients: dextrose, starch, carmel, onion, celery, garlic, bbs shortening. Ingredients: dextrose, starch, onion, celery, garlic, turmeric, bbs shortening. Ingredients: garlic, parsley, black pepper, paprika, sugar, chicken & beef base flavoring.